You know what I love about Anita Dongre’s outfits…that she captures the balance between simplicity and elegance just perfectly. Her outfits are so easy on the eyes, rich yet classy…there is absolutely nothing to not love about her collections. 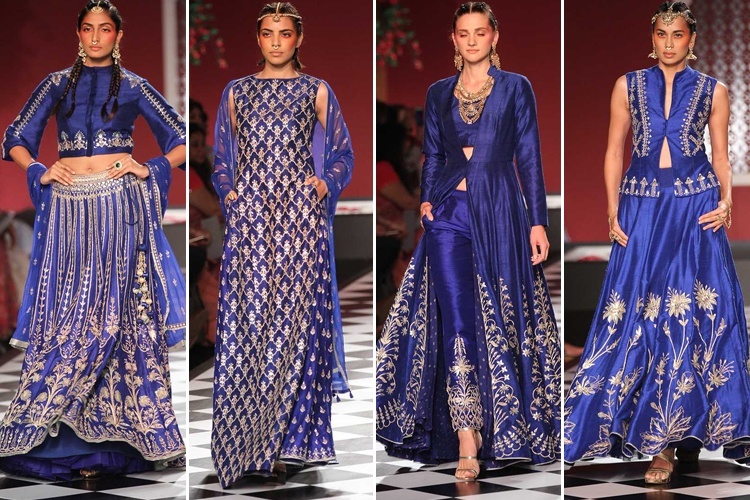 Gota Patti goes hand in hand with Anita Dongre, and there is no doubt, nobody does it better than her. Her epic love collection this time also showcased some of the best gota patti creations in diverse color palettes like golden infused with hues of cream, rusts, browns, reds and pink and muted blue. There was something for everyone to love here. Do I love the color of the outfit more or the design on the outfit? Its a constant struggle…but she just somehow manages to get it right every single time. In her own words, “Even if you are all decked up as a bride, your personal style should always shine through. It’s not about doing an over-the-top look anymore,”. Amen to that ! I love the fact that in this couture week, every designer showcased something or the other wedding related. I am always looking for wedding inspiration…this blog is all about that, so ideally you can say this is my job…but still…there is something that makes me so happy just seeing beautiful outfits. Couture for all purpose means high (expensive) fashion and the designer said it herself that this is the best time to put forward their most lavish collections. The epic love collection was a luxury Bohemian collection of Indian bridal wear meant for the new age spirited bride, where the chintz-inspired prints brought alive a Mughal garden in its full bloom. Weddings are no longer just about the bride. Grooms nowadays don’t want to be left behind and are joining the bandwagon to look their absolute best. While brides have options from lehengas to sarees, gowns and fusion wear…what do we really have out there for our grooms? LOVE LOVE LOVEEE THIS ! Don’t you? An embellished long cape styled jacket on a saree…its brilliant ! With fusion music creating an earthy background, the vintage, Mughal era inspired saris, long skirts, different styles of blouses, dupattas, achkans and kurtas for men, the ensembles exuding elegance wrapped in tradition had the touch of gota patti, dabka, and phulkari used in perfect balance. “Our muse – the young gypsy princess – is free-spirited, yet embraces tradition in her own special way… Traditional styles like the lehenga choli and sari are reinvented in contemporary silhouettes,” said Dongre.